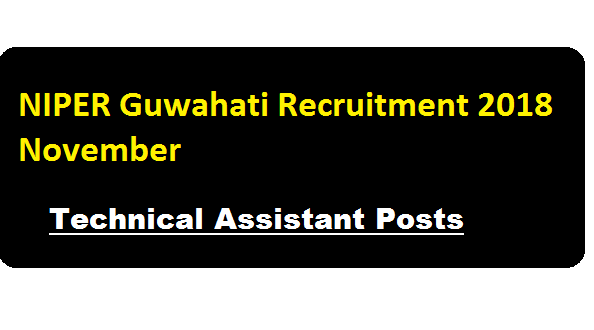 NIPER Guwahati Recruitment 2018 November – Technical Assistant Posts :- NIPER Guwahati has published a recruitment notification in the month of November 2018. NIPER-Guwahati is the fifth Institute to be included in the list of premier Institutes under the Department of Pharmaceuticals, Ministry of Chemicals & Fertilizers, Govt. of India. According to the latest recruitment of NIPER Guwahati 2018 a Walk-in-Interview will be held on 15.12.2018 (Saturday) to fill up the following Non-Teaching positions on contract basis for the projects funded by Govt. of India/Institute. Educational Qualification : Candidates must be First class in Masters Degree in M.S./M.Pharm (Pharmaceutical Analysis/Quality Assurance/ Pharmaceutics)/M.Tech. (Pharmaceutical Engineering/ Mechanical Engineering)/Pharmaceutical Technology/M.Sc. (Analytical Chemistry). Desirable experience: Hands on experience on HPLC,quality control, quality assurance and formulation development. Preference will be given to the candidates having publications in SCI indexed journals. Educational Qualification : Candidates must be a First class in Masters Degree in MS/M.Pharm Pharmacology & Toxicology or Regulatory Toxicology or MVSc or MSc in zoology, biotechnology or biochemistry or BVSC with 2 years experience. Desirable experience : Should have experience in animal experiments, basic techniques like flow cyclometer etc.,. Preference will be given to the candidates having publications in SCI indexed journals. Those who have fulfilled the above qualification are required to attend the walk-in- interview along with the filled in application, original certificates and one set of self-attested Xerox copies of certificates. Certificate verification will commence ½ an hour before the scheduled time of the interview. Incomplete application or without relevant supporting enclosures (attested copies of degrees / certificates / marks sheets / experience certificates / Document certifying date of birth, reprint of important publications etc.) will be out-rightly rejected.